I learnt to cook some of them, such as the kısır or cacık, or the pilav and so on. But, before starting this virtual and culinary journey, I think it is important to give some historical news. The Turkish cooking mainly derives from Ottoman ones that, in turn, draws from the culinary traditions present on the whole territory, that extened from Mediterranean area to Middle East, from the Balkans to Caucasus. So, a very different and rich cooking, with some common dish with other near areas, others typical and regional or completely different from a town to another. As some other countries, also Turkey has got a different climate in all its regions and this characterized the cooking too. For example, in the Northen, in the ared of Black Sea (Kara Deniz), we can find many dishes made of anchovy and corn; in the North East there is the kebab (for example Adana Kebab) or sweets, among them the famous baklava. In the Mediterranean area, from the Aegean Sea and the Marmara Sea, for example, the Mediterranead cooking prevails, made of fish and vegetables. In the Central Anatolian provinces we can find the known mantı (they reminds the Italian ravioli or tortellini). Anyway, a common and essential product of the Turkish cooking is the yogurt, used in many ways and dishes. It is also used as refreshing drink: the popular Ayran. And there are a lot of different types of cheese. Well, now let’s start our journey to the discovery of some Turkish dish through some recipes that you can try to make. So, have a nice reading and… Afiyet Olsun (Enjoy your meal)! One of the most interesting aspect of Turkey it is surely the cooking. During those four years here, in this suggestive land, I could know and appreciate some unique and particular dish. I learnt to cook some of them, such as the kısır or cacık, or the pilav and so on. But, before starting this virtual and culinary journey, I think it is important to give some historical news. Kısır it is like a salad came from the town of Mersin but common in the whole country. It is a fresh dish and easy to make. Here the recipe. Put 2 full glass of bulgur in a container and cover with 2 full glass of hot water. 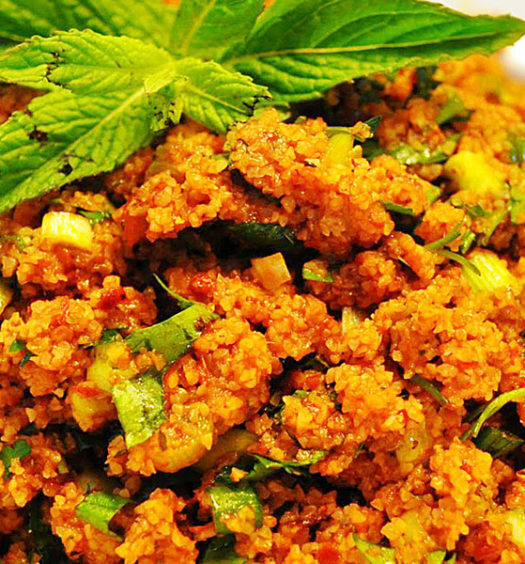 Cover with a top and let the water is completely absorbed ̎cooking̎ the bulgur. İn the meantime, cut in little slices the onions, the cucumbers and peppers and mince the parsley. Once the bulgur is cooked, mix everything and add the olive oil and the red pepper concentrated sauce, the balsamic pomegranate vinegar, salt, black pepper and chili pepper if you want too. Put it in the fridge for a while. One of my Turkish friends said that usually Turkish women add some tomatoes (cut in little slices), salad where to put the kısır…In conclusion they personalize the recipe. For example, I add some mint or basil leaves. İ like so much the kısır; it is a summer rich and fresh dish! Pilav is a dish made of rice. 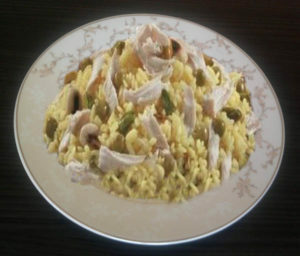 As in Italy we have many recipes for risotto, Turkey too has got many different recipes to make the pilav. Here the recipe of Istanbul pilav. Put the rice in a container with lukewarm water and let to rest about for 30 minutes. Drain the rice and let browning with butter and almonds. Add the chicken breast (earlier boiled and cut in slices ),with peas, pistachio, saffron and ginger too. Let them brown very well. Then, add the salt and the 3 glass of warm water (use the same glass used for the rice) and cover the pot and let it cook about for 20 minutes over low heat. Later, let the pilav rests for other 15 minutes and then you can wait on. Hummus is a typical sauce of Middle East, made of chickpeas, sesame and tahini sauce (i.e. sesame butter), oil, lemon and some spices. 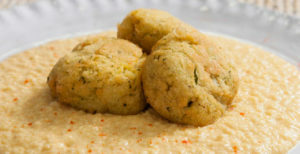 It is eaten as a starter, together with the pita, the typical arabian bread, or with falafel (little chickpea or zucchini burgers) and mixed vegetables. Well, now you have just taste and, try to make one of these Turkish recipes, why not! And… Afiyet Olsun (Enjoy your mail)!